After weeks of speculation, it can finally be confirmed that geneticists in China have modified the DNA of human embryos. It’s a watershed moment in biotech history, but the experiment may ultimately serve as a major setback in the effort to responsibly develop beneficial interventions involving the human germline. Rumors about the experiment had been circulating for weeks, prompting calls for oversight and even a moratorium on such work. The reason for the controversy stems from the nature of germline modifications, which differ from somatic gene therapies in a very fundamental way. Unlike the latter, germline gene therapies are genome-editing techniques that affect egg and sperm cells, which means that patients with modified germ cells can pass them down down to the next generation. Proponents say it’s a necessary and logical next step in medical evolution, but many scientists and bioethicists warn that heritable modifications could lead to unforeseen consequences. In the paper, researchers led by Junjiu Huang, a gene-function researcher at Sun Yat-sen University in Guangzhou, tried to head off...concerns by using ‘non-viable’ embryos, which cannot result in a live birth, that were obtained from local fertility clinics. The team attempted to modify the gene responsible for β-thalassaemia, a potentially fatal blood disorder, using a gene-editing technique known as CRISPR/Cas9. The researchers say that their results reveal serious obstacles to using the method in medical applications. The resulting embryos were a total mess. After applying CRISPR to 86 embryos, 54 of the surviving 71 embryos were genetically tested. Only 28 spliced successfully, and only a fraction of them contained the replacement genetic material. What’s more, the researchers found a surprising number of unintended mutations. The scientists decided to stop the experiment at this stage. “Taken together, our work highlights the pressing need to further improve the fidelity and specificity of the CRISPR/Cas9 platform, a prerequisite for any clinical applications of CRSIPR/Cas9-mediated editing,” conclude the authors in their study, which now appears in the journal Protein & Cell. It should be pointed out that the study was rejected by both Nature and Science, apparently on ethical grounds. But it’s obvious that the science presented by the Chinese scientists is of dubious value, and not the kind of thing typically featured in those science journals. 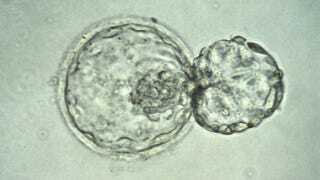 For example, the high rate of mutations may have something to do with the abnormal nature of the embryos used. The paper also fails, says Caplan, because it doesn’t say much about the ethics of what was done. For example, the embryos came from a fertility clinic, but there’s no mention if an ethics committee approved the experiments. It’s also not known if the embryos were frozen, newly made, or spares, or if the people who created the embryos consented to the research. Sadly, this experiment may result in more harm than good in terms of the public’s perception of how germline modifications are being developed and how they’ll come to be used in standard medical practice. The ability to modify human DNA holds great promise as a means to eradicate horrific genetic diseases before a baby is born. What’s more, it could eventually be used for human trait selection, i.e. the pending practice of selecting the genetic characteristics of offspring. Germline modifications are poised to become a part of the human future, as already witnessed by the introduction of three-parent in vitro fertilization for the purpose of eliminating mitochondrial diseases. The exact nature and appropriateness of germline interventions has yet to be determined, but the path to its development must begin somewhere. The route chosen by the scientists in China is clearly not the right one. Caplan says the geneticists should have appointed an independent committee to assess the value of their experiment, but doubts it would have received approval based on scientific or ethical grounds. For example, researchers will need to talk about how they’re going to dispose of the embryos, and how their work can be verified and open to public and professional scrutiny. But as for a moratorium on such work, Caplan says he doesn’t fall into that camp. Instead, he believes the scientific community should address the issue head on and bring people together both nationally and internationally.